Five decades later, Janelle Monae’s “Hell You Talmbout” gives credence to the comparison by supplying the nascent movement with its own anthem. The song itself, released last week, has been called “visceral” by NPR, but it’s much more than that. The song’s sparse arrangement—it’s just percussion and call-and-response vocals—harks back to the sanctified roots of Black American music, the field hollers which predate jazz, blues, rock, funk, house, and rap. But the power of the song comes from the repetitive mention of Black lives lost, mostly at the hands of police—in the recorded version, they include Walter Scott, Trayvon Martin, Michael Brown, Freddie Gray, Miriam Carey, Sharonda Singleton, Sandra Bland, Tommy Yancey, Jordan Baker, Amadou Diallo, and Emmett Till. The juxtaposition of arrangement and message suggest a cultural continuum as serpentine as the Mississippi river, a context in which the souls of black folk never change, although the environment in which the field hollers resound has shifted from rural slave plantation to highway chain gang to modern-day, urbanized city—bright lights and all. “Hell you Talmbout” takes the listener back like the movie “Sankofa,” reminding those with ears to hear that the liberation struggle is not only very real, but its lifeblood is literally the death throes of innumerable murdered brothers and sisters, extinguished by the long shadow of the dark side of American history. Monae performed the song on the Today show on August 14, but her speech about #BLM was reportedly cut short. No biggie; her response to corporate America restricting her message was to take it to the streets. Currently on tour with her artist collective Wondaland, Monae has been connecting with local activists at every stop, lending her celebrity presence to the cause of justice. To her credit, she’s seemed less interested in self-promotion than in building with an activist community who share her ideological leanings. 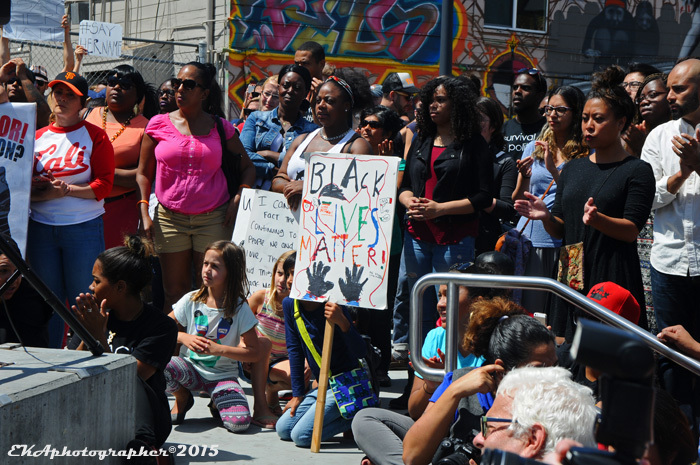 This past Sunday, prior to a show at SF’s Independent, Monae and Wondaland were the guests of honor at a demonstration/rally against “police terror” in solidarity with the Stop Mass Incarceration Network . 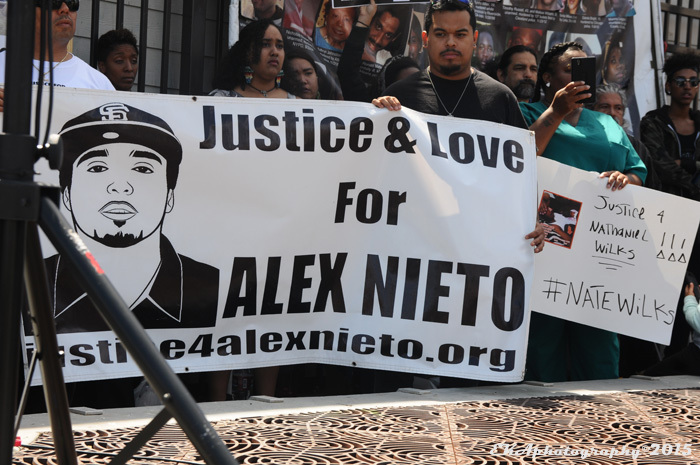 Also present were the families of Alex Nieto, Oscar Grant, Pedie Perez, and Oshay Davis, as well as supporters of transgender victims of violence including Kandis Capri, Ashton O’Hara, and Elima Walker. More placards were visible in the audience, bearing the names of Alan Blueford, Ramarley Graham, Michelle Cusseaux, Nate Wilks, and many others. Each of the families of police victims present were given an opportunity to speak, to mourn, to lament, to call for justice. 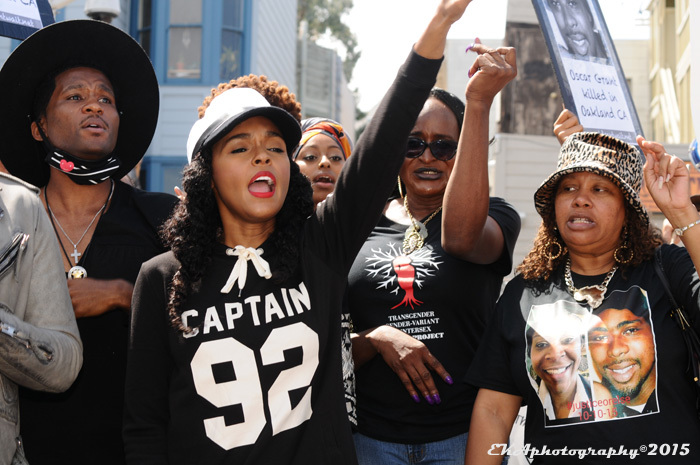 And the Black transgender community showed up to make the point that their lives mattered as much as anyone’s. Another group, calling themselves the Last 3%, bemoaned the whitening of San Francisco due to the disappearance of its once-healthy Black population, now reduced to a single-digit demographic. There were also performances, including drummers from Loco Bloco and a conscious/political rapper who delivered fiery lyrics in the vein of Public Enemy’s Chuck D.
The highlight was a ten-minute version of “Hell You Talmbout,” preceded by a brief statement by Monae. “What we see right before our eyes is the unity that’s happening right now. There’s so many different shades that we’re all looking at right now, we’re coming together. We don’t believe in a red state or a blue state. This is a purple state. It’s all together. I send my condolences to everybody’s family, everybody’s loved one that’s here today. 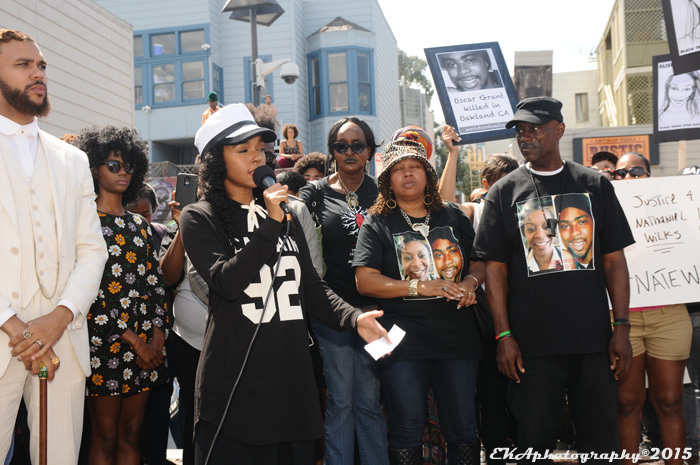 The energy in the 24th St. BART plaza was electric as Monae started out by name-checking Maya Holm, Aiyana Jones, and Sandra Bland. “Say Her Name!!! Say Her Name!!! Say Her Name!! !, Say Her Name!! !, Say Her Name!! !, Say Her Name!! !, Say Her Name!! !,” Say Her Name!! !,” the entire crowd—which looked to be several hundred people—shouted. More names followed: Nate Wilks, Sean Bell, Alicia Walker, Alex Nieto, Oscar Grant, Sharonda Singleton, Ramarley Graham, Pedie Perez, Alex Martinez, DeWayne Ward, Fred Hampton, India Clarke, Oshay Davis, and David McCarter. The names themselves hold power, adding a directness to “Hell You Talmbout” which the vaguely-worded liberation anthems of past generations lacked. One might say the song journeys even deeper into ritual tradition than even Sam Cooke or Mavis Staples dared at that time. It makes for an interesting dichotomy, advancing the methodology of social protest music while maintaining a stripped-down, retro sensibility. The fact that Monae and Wondaland are doing this all over the country makes it even more fluid, since at every stop, different names are said. 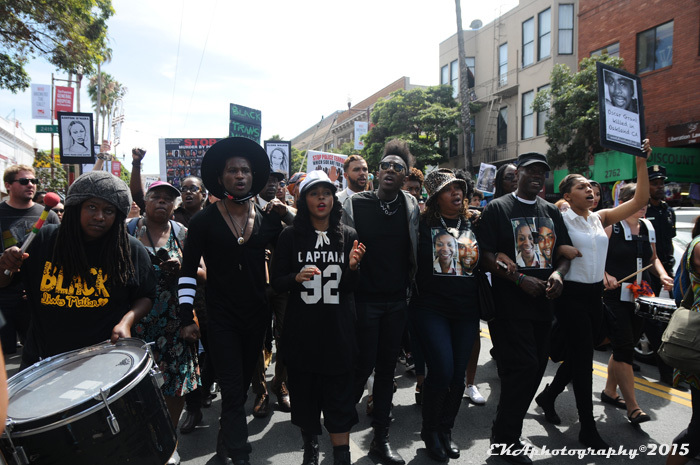 After the song concluded, Monae led a peaceful yet vocal procession through the Mission which felt like a civil rights movement is supposed to feel – minus the direct antagonism of Alabama police dogs or Oakland tear gas. Being alive, being visible, being vocal, and being in solidarity with a movement which is growing larger by the minute was a good feeling. Categories: Uncategorized | Tags: Alex Nieto, Black Lives Matter, Cephus Johnson, Classic Man, End Mass Incarceration, Hell You Talmbout, Janelle Monae, Jidenna, Loco Bloco, Oscar Grant, Say Her Name, SF Mission District, Wondaland | Permalink.